16 Back to School Bash 6 p.m.
23 Douglas Co. Hall of Fame Induction (Serve Lunch) 11:30 a.m.
FFA is a dynamic and growing youth organization, nearly half-a-million student members strong, based in agricultural science education. The National FFA is successfully changing lives and preparing students for leadership, personal growth and career success. These lessons, skills, friendships and experiences shape our members and the benefits remain for their entire lives. Members participate in a wide range of agricultural science education activities, leading to the possibility of more than 300 professional career opportunities. The continued success of our student members remains the primary mission of FFA. Any student in grades 7-12 who is enrolled in an agriculture course at a public school is eligible to join FFA. Students from all socio-economic, racial and geographic backgrounds make up the organization’s impressive and diverse base. More than 70 percent of our members are from rural non-farm, urban and suburban areas and the remaining 30 percent come from more traditional farming communities. Why Agricultural Science Education & FFA? Agricultural science education and FFA help students discover their passion in life, develop their strengths, introduce them to new experiences and achieve success. The agricultural science education program is more than " just a class" – it is an integrated approach to education. This integrated approach provides students with academic instruction, hands-on experience and the development of critical life skills necessary for career success. The academic instruction is similar to traditional classes with the setting in the classroom, greenhouse, agriscience laboratory, agricultural mechanics shop or other agriculture centers where students learn from the agriculture teacher. However, unlike traditional classes, the agricultural science classes are like a beehive of activity with students discovering how much fun learning can be by doing. Supervised Agricultural Experiences (SAEs) give students a well-rounded view of career opportunities by exposing members to realworld hands-on agricultural experiences conducted outside of the classroom. An SAE is a work experience that is created and carried out by the student. This part of the integrated model gives students a chance to explore the career areas that interest them. The SAE must relate to the field of agriculture but can be as diverse as food science to wildlife management to experiments in animal nutrition. Students are encouraged to be entrepreneurs by starting a business or gain valuable career experience by working for an established company. FFA is the organization for students who are studying agriculture. 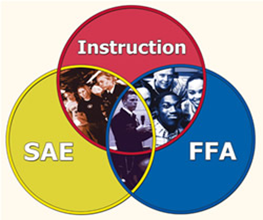 The FFA mission is to make a positive difference in the lives of students by developing their potential for premier leadership, personal growth and career success. FFA allows students to develop life skills that are critical to future success such as leadership, teamwork and public speaking. FFA members also benefit from competitions and award programs that provide helpful connections between classroom instruction and real-life scenarios that the future workforce will experience. By joining FFA and experiencing the benefits of the organization, student members are creating their own success stories across the United States, like thousands of members who have come before them.